Not having a television, I had never heard of Gregg Wallace before Gregg’s Favourite Puddings landed on the doorstep. A co-presenter of BBC show Masterchef, apparently he is well known for his sweet tooth, and this book is like a greatest hits of the pudding world. On the lighter side of things, there is a focus on fruit puddings (Wallace is a big fan of the crumble) and a great selection of ices and mousses, including an exceptionally tempting Coffee Hazelnut Ice. The chocolate chapter, however, tips the balance way, way in the other direction. Chocolate Gateau with Rum and Walnuts, Triple Chocolate Brûlée and Hot Chocolate Liqueur Soufflé are just some of the riches on offer. The Chocoholic’s Alaska is the kind of pudding that might incite you to invite people round and serve only this. The classics also feature in their own chapter, with recipes for Brown Betty, Strawberry Shortcake and an almondy Tiramisù with amaretti biscuits. In fact there is rather an almond theme throughout the book: an Apple Pie comes complete with almond pastry, almonds and figs make it into some Baked Apples and the Vanilla Biscotti are flecked with toasted, unblanched almonds. Although Wallace’s presence in the book is limited to short introductions, the recipes stand strongly by themselves. Open any page and dip into pure indulgence of a very, very tasty kind. 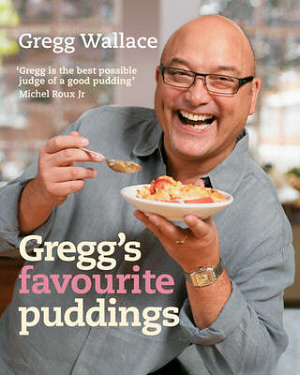 Gregg’s Favourite Puddings by Gregg Wallace is published by Octopus Publishing Group.